Intense and lasting moisturising. Soothes. Helps repair skin. Proven efficacy. Safe & pure formulation. For dry, sensitive or irritated skin (eczema, psoriasis, dermatitis...). Scientifically proven benefits! The Hydrating Gel Plus HS – Face (40ml) is an exceptionally pure head-to-toe hydrating cream. It provides an intense and long-lasting moisturising, soothes and helps repair skin. 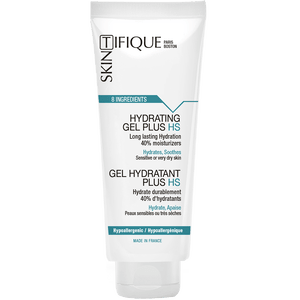 The Hydrating Gel Plus HS is based on an exclusive patented technology which brings a progressive and long-lasting delivery of active moisturising and soothing agents. After overexfoliation with physical and chemical exfoliants and severely damaging my skin, it produced 0 oil at all. I tried SOAKING my skin in rosehip oil and layered moisturisers like crazy, but nothing moisturised as good as this product. Keeps my skin hydrated all day without irritating my extremely sensitive skin.